The sacred kingfisher (Todiramphus sanctus) is a medium sized woodland kingfisher. They live in mangroves, woodlands, forests, and river valleys in Australia, New Zealand, and other parts of the western Pacific. In New Zealand the species is also known by its Māori name Kōtare. 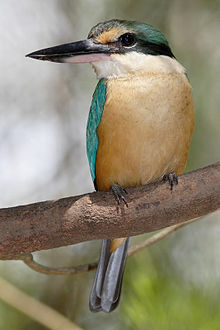 The sacred kingfisher is mostly turquoise, with white underparts and collar feathers. Both sexes are similar. The females are usually more dull colored. Juveniles have rusty-brown edges on the collar and underparts. The bird is 19–23 cm (7.5–9.1 in) long. They feed on insects, small crustaceans, fish, small rodents and reptiles. Usually, a bird will sit on a low branch and wait for prey to pass by. It swoops down to grab the prey and returns to its perch to eat, much like a hawk. Once a pair of birds has mated, both members of the pair dig the nest. The nest is usually on a burrow in a river bank or a large, empty branch. The female lays about five eggs. Both birds incubate the eggs and take care of the young. Wikimedia Commons has media related to Todiramphus sanctus. ↑ BirdLife International (2009). Todiramphus sanctus. In: IUCN 2009. IUCN Red List of Threatened Species. Version 2009.2. <www.iucnredlist.org>. Downloaded on 04 March 2010. ↑ Heather, Barrie; Robertson, Hugh (2005). The Field Guide to the Birds of New Zealand (Revised ed.). Auckland: Viking. ISBN 0-14-302040-4. This page was last changed on 17 October 2014, at 20:36.